West Liberty-Salem’s Grace Estes (15) drives around Triad’s Kristin Bailey (21) on Thursday. 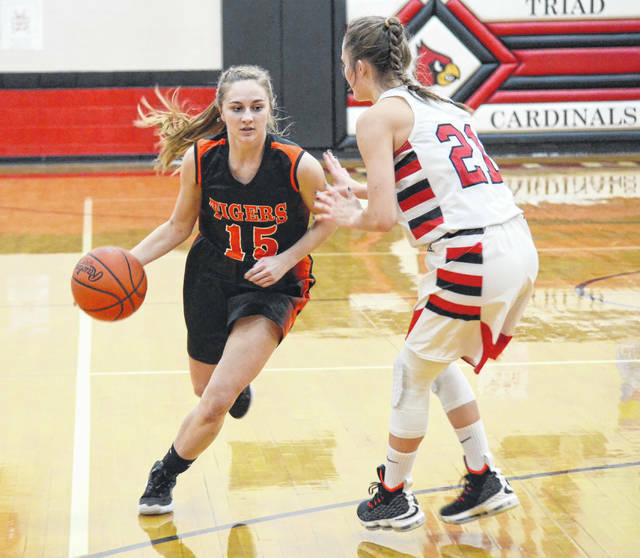 NORTH LEWISBURG — Thursday featured Triad’s gymnasium with frigid temperatures and a game between teams headed in opposite directions. Ascending West Liberty-Salem defeated injury-riddled Triad, 64-28, in OHC girls basketball. The Cardinals have virtually no depth after being hit with multiple injuries early in the year, but that didn’t stop them from competing early with WL-S, which is looking to have its name thrown into the state rankings. Triad came out on a 5-0 flurry in the first three minutes, but the Tigers roared back on a 10-0 run to end the quarter. As the game wore on, fatigue set in for the depleted Cardinals and West Liberty-Salem’s athleticism took over. Turnovers became common for the home team, with the visitors capitalizing on seemingly every opportunity. In total, Triad turned the ball over 29 times to West Liberty-Salem’s 10. Kelsey Day led the Tigers with 20 points, including six of the Tigers’ nine three-pointers. Gabby Hollar had 14 points and Selena Weaver scored 11. Cati LeVan finished with 9 points and Frani LeVan had 8 for Triad. The Tigers led 29-9 at the half, but exploded for 23 points in the third quarter to take a 52-14 lead into the final period. It was a convincing showing for a squad that has now beaten three state-ranked opponents and may finally find a spot in the polls next week. Triad (7-11, 3-10 OHC) travels to Mechanicsburg on Saturday while West Liberty-Salem (16-3, 13-0 OHC) – winners of 16 in a row – hosts Northeastern on Monday. https://www.urbanacitizen.com/wp-content/uploads/sites/36/2019/01/web1_GraceEstes013119_ne2019131185755309.jpgWest Liberty-Salem’s Grace Estes (15) drives around Triad’s Kristin Bailey (21) on Thursday.